Integrity Saw & Tool is also the leader in manufacturing custom carbide tipped saw blades. Our years of experience and CNC carbide grinders allow us to produce a custom saw blade to meet your precise specifications. Many production applications require a specific custom saw blade to ensure a clean cut is achieved without burrs, chipping, or melting. 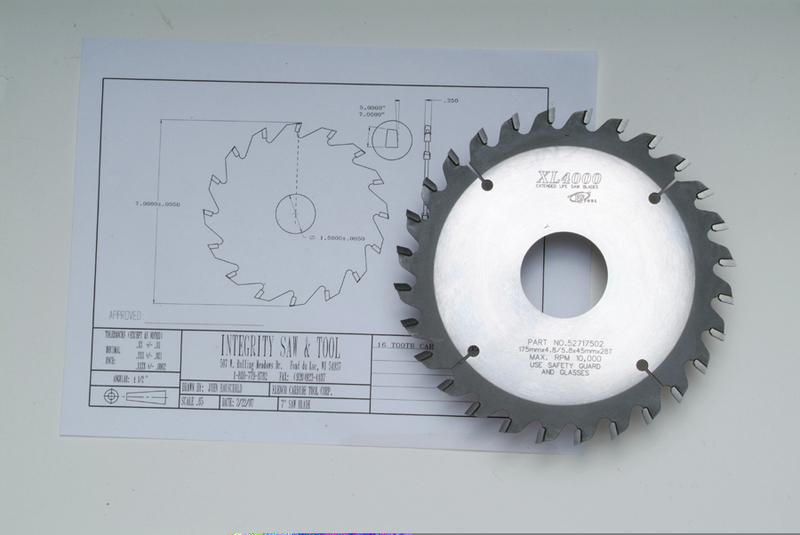 Special kerfs and diameters are not a problem when manufacturing custom saw blades. We manufacture custom saw blades for the wood, plastic and non-ferrous industries from 2 inches to 36 inches. Integrity Saw & Tool stocks a large assortment of saw plates ready to be tipped to create your custom saw blades. Selecting the proper grade of carbide is another essential part of the equation. Numerous grades of carbide - such as corrosion resistant, high impact, and steel cutting - are available. If you would like a recommendation on the grade of carbide your custom saw blades will require, complete our Get a Quote form and we will contact you as soon as possible. © Integrity Saw & Tool. All rights reserved. Wisconsin web design by BrownBoots Ineractive, Inc.